In 2010, I operated a hyperlocal news site called Offbeat Auburn. The site focused on local music, art, and…well…offbeat topics. Over the course of the year, Offbeat Auburn generated several thousand monthly pageviews and supported a Facebook page with nearly 600 “Likes.” In addition to an events calendar and listing of local arts organization, I produced audio features including this visit with our local roller derby team. The roller skating rink in Phenix City is not well-marked. The night that I visited the Burn City Rollers in one of their two practice homes, I had to resort to calling a friend who is familiar with the area to talk me through directions where my GPS failed. I was more than a half hour late when I walked into the dimly lit room where about a dozen women were practicing drills. 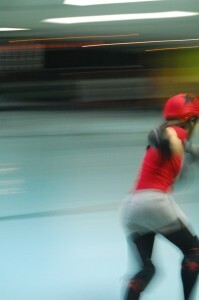 That’s when I knew how serious they are about roller derby. The Burn City Rollers practice off hours in out of the way locations. They’ve raised money at a local burger joint and washed cars, but still fund most of what they do out of their own pockets. They’ve posted flyers in bathrooms to get word out about the team and work Facebook for all its worth to get word out about their bouts. And, let’s face it, skating fast around the track is tough work, especially when you’re facing another team determined to slow you down. With derby names like 9lb Hammer, Amyn Atcha, and Cho Cold, it’s clear derby is fun for them and it should be, but it’s hard work too, both on and off the track. Your next chance to see for yourself is in Auburn where the roller rink is, I’m happy to say, clearly marked.